Congratulations to "Jayne" and "Jonetta", the winners in Jessica's giveaway. Thank you to all who participated! 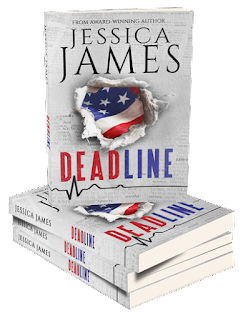 I’m very excited to be here today to talk about my latest novel DEADLINE, which began as a seed sown from my past experience as a newspaper reporter. Although I never had the encounters my main character Caitlin does, it was a pretty interesting career for someone straight out of college (and the next 18 years). I had the opportunity to rub elbows with governors, Supreme Court justices, senators, media moguls (Ted Turner to be exact), and movie stars (like Sam Elliott, for one). One of the things I learned quite quickly as a rookie reporter is that cops and journalists, for the most part, do not trust each other. 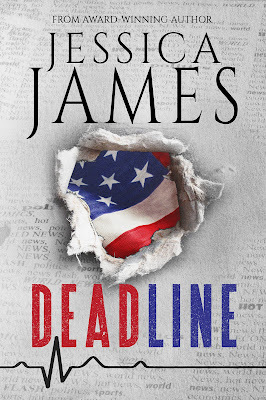 Of course as an author, that storyline makes for intense conflict—and when the main character is a strong-willed homicide detective who is a retired Navy SEAL, that makes for some fun story-telling. I developed some great friendships with police officers during my career, but as you will see from my excerpt below—my main character’s first meeting with Detective Blake Madison could hardly have gone any worse. I am very honored to have recieved this nice review blurb for DEADLINE. Creeping in the shadows, Caitlin stopped beside the window and bent cautiously forward to get a glimpse at the crime scene inside. Most notable among the officers busy at their jobs was a broad-shouldered man with an unlit cigarette dangling out of his mouth. The way he commanded attention and directed the others in the room made Detective Madison easy to recognize. Although she’d only ever seen him from a distance and in passing, he was not the type of man one could forget. Concentrating now on the crime scene, she didn’t notice the detective leave the room until she heard the sound of approaching footsteps. Luckily, his back was to her as he stopped and attempted to light a cigarette on the deck just a few feet away. Caitlin prepared to take a step back into the shadows, but before she had time to move, the detective cursed. Cupping his hands, he turned completely around to put his back to the wind that had extinguished his lighter. Just as the cigarette sparked red, his expression changed and Caitlin knew he had spotted the tip of her boots. She held her breath as he slowly raised his head, taking in every inch of her, until he stared straight into her startled eyes. Without saying a word he lowered his gaze from her face to the small notebook she held, and then raised it again. Disapproval and displeasure radiated from him in a palpable wave. “I hope you’re not a reporter.” His voice was low and calm… hostile. Though her heart pounded at his tone, Caitlin found herself momentarily flustered by the color and depth of his eyes. Even in the dim light she could see they were a deep shade of blue—the type of eyes that drew you in and made you pause. The type that missed nothing and announced to anyone who looked close enough that this was not a man to be messed with. He’s a relentless homicide detective. She’s an uncompromising journalist. Neither desires to work together—but they’ll never uncover the truth alone. Landing a front page headline isn’t why reporter Caitlin Sparks is investigating a string of suspicious deaths connected to the U.S. State Department. She has a personal stake in finding the killer. Detective Blake Madison has a connection to the murders too, and will risk anything to uncover the truth. But a journalist is the last person he’d rely on to help him solve a crime—especially one whose trail of evidence leads back to him. Joining forces becomes essential as the body count continues to grow. Someone powerful doesn't want the truth to come out—and will stop at nothing to make sure no one talks. On the run with nowhere to turn, the couple devises a plan to expose the killer. The risk is great and the chance of success small, but the ultimate outcome is something neither one of them envisioned. Jessica will be giving away two electronic copies of DEADLINE to two readers leaving a comment or email entry. Giveaway ends 11:59pm EST April 10th. Please supply your email in the post. You may use spaces or full text for security. (ex. jsmith at gmail dot com) If you do not wish to supply your email, or have trouble posting, please email maureen@justromanticsuspense.com with a subject title of JRS GIVEAWAY to be entered in the current giveaway. Being a newspaper reporter would certainly have been very interesting. Full of inspiration for your writing. Many of my favorite authors have been or are still reporters. This sounds just like a book I would love! Great premise! Love the idea of a detective and journalist teaming up...loads of tension. Your first-hand experience should make this an even more interesting read. Thanks for the post. It sounds like the last thing Caitlin and Jake want to do is work together but they're going to have to if they want to find the killer. I'd love to read this thrilling story.